Don't get wrong with my post title. I don't do carry lantern anymore after secondary school. 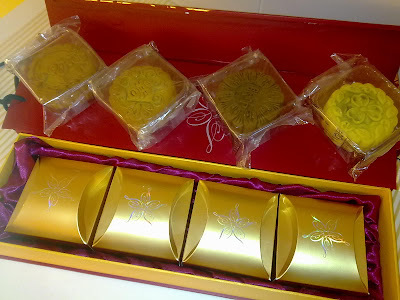 It's not my favorite activity but I love mooncake. Well, this weekend is quite enjoyable and easy-going. Saturday we had 'Dim Sum' at Eest, Westin Hotel K.L, opposite Pavilion with 4 guests. Truly amazing for me just be there & listen to their conversation. Interesting shall I call. Wonderful 'Dim Sum' as usual and fabulous Durian Mooncake! Freshly made and lovely taste. It is in sale if you want some, go and get it in The Westin Hotel K.L. 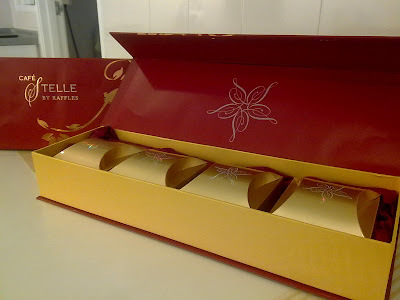 We had some there, nevertheless we've bought mooncake from Cafe Stelle by Raffles in Pavilion after brunch buffet. There are few flavors like lemon, coffee, chocolate and of course common pure/white lotus flavors. The taste is sweet and what really attracts me is the packaging. It's red & gold colors. Ask Concierge if you do not know where is Cafe Stelle by Raffles. But I can tell you here that there is a small counter selling the mooncake at the entrance of 2nd floor of TANG. Today Sunday, we just came back from lunch in KLCC. Bought myself two books for my IELST preparation and one book for 'teaching how to sleep well'. I have to take this IELST exam for migration to Australia end of this year and its time to heal my dream-in-sleeping illness. I have dream whenever I sleep, regardless nightmare or good one. Hopefully everything goes well. Happy Lantern Festival to all my friends.